Start off your visit on the 26th (Fri): get a new perspective on nature at Geological Survey Museum, stop by Herrle & Herma Jewellers, then tee off at Omeya Golf and Residential Oasis, and finally examine the collection at Trans-Namib Railroad Museum. On the 27th (Sat), you'll have a packed day of sightseeing: take an exotic tour of a safari tour and then tour the pleasant surroundings at Avis Dam Nature Reserve. Plan trip to Windhoek with our itinerary maker to find out where to go and what to do. Berlin, Germany to Windhoek is an approximately 17.5-hour flight. You'll lose 1 hour traveling from Berlin to Windhoek due to the time zone difference. In July, plan for daily highs up to 26°C, and evening lows to 9°C. Finish your sightseeing early on the 28th (Sun) so you can drive to Sesriem. 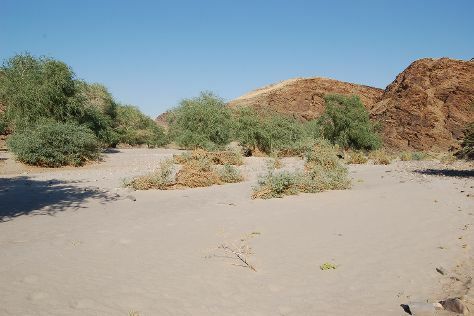 Sesriem is a small settlement located in the Namib Desert, in Namibia, close to the southern end of the Naukluft Mountains. 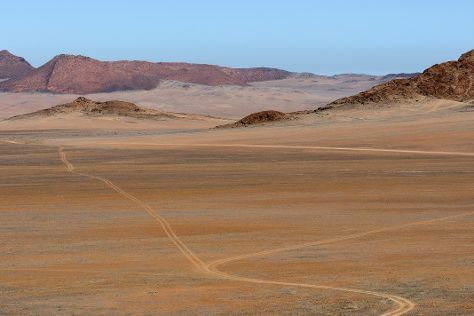 On the 28th (Sun), admire nature's extreme beauty at Namib-Naukluft National Park. On the 29th (Mon), you'll have a packed day of sightseeing: admire nature's extreme beauty at Big Daddy Dune and then get outside with Outdoor Activities. To find maps, photos, ratings, and tourist information, you can read our Sesriem trip planner . You can drive from Windhoek to Sesriem in 8.5 hours. 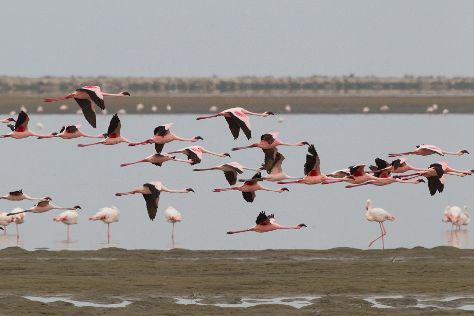 Wrap up your sightseeing by early afternoon on the 30th (Tue) to allow enough time to drive to Walvis Bay. Kick off your visit on the 31st (Wed): head outdoors with Outdoor Activities and then paddle through the water with a kayaking and canoeing tour. On the 1st (Thu), you'll have a packed day of sightseeing: walk around Long Beach Leisure Park, tour the pleasant surroundings at Dune 7, and then take a leisurely stroll along Walvis Bay Waterfront. For ratings, reviews, traveler tips, and other tourist information, read Walvis Bay trip planner. You can drive from Sesriem to Walvis Bay in 10.5 hours. In July, daytime highs in Walvis Bay are 26°C, while nighttime lows are 11°C. Finish up your sightseeing early on the 1st (Thu) so you can go by car to Swakopmund. Start off your visit on the 2nd (Fri): get a dose of the wild on a nature and wildlife tour. Keep things going the next day: take in the spiritual surroundings of German Evangelical Lutheran Church, then stop by Kristall Galerie, then admire the landmark architecture of Hohenzollernhaus, and finally take in the dramatic natural features at Moon Landscape. For where to stay and other tourist information, go to the Swakopmund trip planner . Traveling by car from Walvis Bay to Swakopmund takes 2.5 hours. Alternatively, you can do a combination of train and car. In August, daytime highs in Swakopmund are 24°C, while nighttime lows are 11°C. Wrap up your sightseeing on the 3rd (Sat) early enough to drive to Damaraland. Kick off your visit on the 4th (Sun): take in the dramatic natural features at Messum Crater. Get ready for a full day of sightseeing on the 5th (Mon): contemplate the long history of Twyfelfontein. For traveler tips, other places to visit, where to stay, and other tourist information, use the Damaraland road trip app . You can drive from Swakopmund to Damaraland in 3 hours. Expect somewhat warmer temperatures when traveling from Swakopmund in August; daily highs in Damaraland reach 28°C and lows reach 17°C. Wrap up your sightseeing on the 5th (Mon) to allow time to travel to Etosha National Park. Start off your visit on the 6th (Tue): tour the pleasant surroundings at Etosha Pan and then make a trip to Okaukuejo waterhole. To find other places to visit, more things to do, photos, and tourist information, go to the Etosha National Park itinerary builder tool . Traveling by combination of car and flight from Damaraland to Etosha National Park takes 7 hours. You'll set off for Chobe National Park on the 7th (Wed). Eschew the tourist crowds and head to Savute Reserve and Nogatsaa and Tchinga. Escape the urban bustle at CARACAL Biodiversity Center and Serondela Reserve. For more things to do, maps, where to stay, and tourist information, refer to the Chobe National Park trip itinerary site . Use the Route module to find suitable travel options from Etosha National Park to Chobe National Park. Cap off your sightseeing on the 10th (Sat) early enough to travel to Victoria Falls. Kids will appreciate attractions like Scuba & Snorkeling and Victoria Falls Snake Park. Escape the urban bustle at Nature & Wildlife Tours and Siduli Hide. On the 13th (Tue), spend an adventurous day with a kayaking and canoeing tour. And it doesn't end there: get outside with Outdoor Activities, stop by Cultural Vibes Music Shop, take in the exciting artwork at Prime Art Gallery, and push the limits with an extreme tour. Planning Victoria Falls trip won't be overwheling when you use's Insprock itinerary maker. You can take a shuttle from Chobe National Park to Victoria Falls in 4 hours. Expect a daytime high around 33°C in August, and nighttime lows around 11°C. Finish your sightseeing early on the 14th (Wed) to allow enough time to travel back home.